Hello, everyone! It may seem a little early to be thinking about Christmas, but I decided to create a Christmas card today! I love the way this turned out, and it didn't take me long at all! 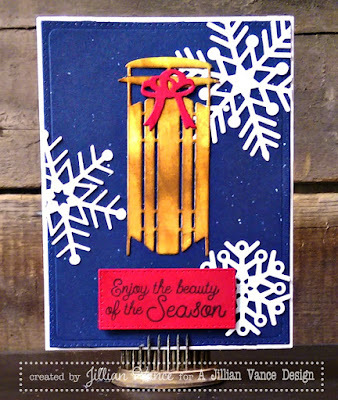 I used Ranger's Tim Holtz Distress Ink in Vintage Photo to transform the white sled into something that looks like wood grain. I'm obsessed! Below is the A Jillian Vance Design products I used along with the other products that I used to put the card together!